Every detail of your life  what you buy, where you go, whom you love  is being extracted from the Internet, bundled and traded by data-mining companies. What's in it for you? There is now an enormous multibillion-dollar industry based on the collection and sale of this personal and behavioral data, an industry that Senator John Kerry, chair of the Subcommittee on Communications, Technology and the Internet, is hoping to rein in. Kerry is about to introduce a bill that would require companies to make sure all the stuff they know about you is secured from hackers and to let you inspect everything they have on you, correct any mistakes and opt out of being tracked. He is doing this because, he argues, "There's no code of conduct. There's no standard. There's nothing that safeguards privacy and establishes rules of the road." At Senate hearings on privacy beginning March 16, the Federal Trade Commission (FTC) will be weighing in on how to protect consumers. It has already issued a report that calls upon the major browsers to come up with a do-not-track mechanism that allows people to choose not to have their information collected by companies they aren't directly doing business with. Under any such plan, it would likely still be O.K. for Amazon to remember your past orders and make purchase suggestions or for American Express to figure your card was stolen because a recent purchase doesn't fit your precise buying patterns. But it wouldn't be cool if they gave another company that information without your permission. Taking your information without asking and then profiting from it isn't new: it's the idea behind the phone book, junk mail and telemarketing. Worrying about it is just as old: in 1890, Louis Brandeis argued that printing a photograph without the subject's permission inflicts "mental pain and distress, far greater than could be inflicted by mere bodily harm." Once again, new technology is making us weigh what we're sacrificing in privacy against what we're gaining in instant access to information. Some facts about you were always public  the price of your home, some divorce papers, your criminal records, your political donations  but they were held in different buildings, accessible only by those who filled out annoying forms; now they can be clicked on. Other information was not possible to compile pre-Internet because it would have required sending a person to follow each of us around the mall, listen to our conversations and watch what we read in the newspaper. Now all of those activities happen online  and can be tracked instantaneously. Part of the problem people have with data mining is that it seems so creepy. Right after I e-mailed a friend in Texas that I might be coming to town, a suggestion for a restaurant in Houston popped up as a one-line all-text ad above my Gmail inbox. But it's not a barbecue-pit master stalking me, which would indeed be creepy; it's an algorithm designed to give me more useful, specific ads. And while that doesn't sound like all that good a deal in exchange for my private data, if it means that I get to learn when the next Paul Thomas Anderson movie is coming out, when Wilco is playing near my house and when Tom Colicchio is opening a restaurant close by, maybe that's not such a bad return. Since targeted ads are so much more effective than nontargeted ones, websites can charge much more for them. This is why  compared with the old banners and pop-ups  online ads have become smaller and less invasive, and why websites have been able to provide better content and still be free. Besides, the fact that I'm going to Houston is bundled with the information that 999 other people are Houston-bound and is auctioned by a computer; no actual person looks at my name or my Houston-boundness. 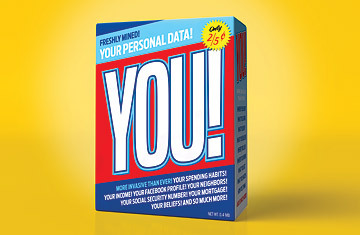 Advertisers are interested only in tiny chunks of information about my behavior, not my whole profile, which is one of the reasons M. Ryan Calo, a Stanford Law School professor who is director of the school's Consumer Privacy Project, argues that data mining does no actual damage. "We have this feeling of being dogged that's uncomfortable," Calo says, "but the risk of privacy harm isn't necessarily harmful. Let's get serious and talk about what harm really is." The real problem with data mining, Calo and others believe, arises when the data is wrong. "It's one thing to see bad ads because of bad information about you. It's another thing if you're not getting a credit card or a job because of bad information," says Justin Brookman, the former chief of the Internet bureau of the New York attorney general's office, who is now the director of the Center for Democracy and Technology, a nonprofit group in Washington. Russell Glass, the CEO of Bizo  which mines the fact that people are business executives and sells that info to hundreds of advertisers such as American Express, Monster.com, Citibank, Sprint and Google  says the newness of his industry is what scares people. "It's the monster-under-the-bed syndrome," Glass says. "People are afraid of what they really don't understand. They don't understand that companies like us have no idea who they are. And we really don't give a s  -. I just want a little information that will help me sell you an ad." Not many people, he notes, seem to be creeped out by all the junk mail they still get from direct-marketing campaigns, which buy the same information from data-mining companies. "I have a 2-year-old daughter who is getting mail at my home address," he says. "That freaks me out." See pictures of Facebook's headquarters. See "Google's War Against Rotten Search Results."